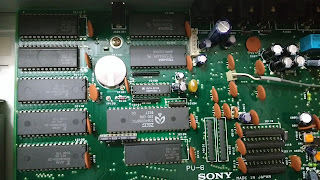 There are six Mask-ROM chips inside each of those video titlers, all from Fujitsu: 3 x 831000 and 3 x MB834000, totalizing 1920KB, which is a lot of data for an 8 bits computer. Besides some version numbers, I don't believe the contents of those ROMs are too different between the two titlers, Alexandre Tabajara have a XV-J777 and made a dump of all those ROMs, so we will examine them. My guess is that one of those chips have the JIS1 and the other one the JIS2 fonts, in different resolutions. With this last one, we can say that all MB834000 chips are related to handle the input and display of Japanese language. I remember that JFEP string... maybe from one of those latest examined ROMs? Yes! In HB-F1XDJ's MSX-JE ROM! That explains why, although very similiar, the sha1sums of those ROMs doesn't match: XV-J777 have a newer version of F1XDJ (and F1XV) firmware. This firmware is mapped to the higher 64KB of a 831000 ROM. We still need take a look at lower 64KB. By the name of those files, say that they are fonts with 16 and 24 points is a good bet, but why have more fonts? We already have 1024KB of fonts in the Kanji-ROM ICs. Things get a bit clearer after we know that "Eisu" (英数) means "Alphanumeric", so those are the fonts for latin alphabet, and those in the Kanji-ROM are... Kanji. It's a health check software!! And, by this list of ROMs to be tested, now we know that the chip that have the second half of X1XDJ's firmware is the Dictionary part of MSX-JE. My guess: the XV-J550 was first released in Japan. Seeing that it's a good product and there is a broader home video market, Sony wanted to sell it in Europe, but had to make some revisions on the board for this release; this new board was meant to be shared by the two versions of the titler (XV-J550 and XV-T550), but for some reason the XV-J550 with the new PCB did not reached the market (or we didn't yet found any XV-J550 with this new board). I believe that, instead release the same old product with a new internal organisation, Sony did launched new video titlers, like the XV-J770. The test program shared by XV-T550 and XV-J777 seems to confirm my guess, while the western markets got the XV-T550 the Japanese market got XV-J770 and XV-J777. There is now only one ROM that we don't examined yet and we already know what is there. We found the MSX BIOS, Kanji-ROM, MSX-JE and even a Test Program, but what is missing in this Video Titler? The Video Titler Software! And yes, as expected, the last 831000 is the Video Titler Software. The first bank have the program header and the video titler software starts here. The second and third bank seems to have some program parts and the last block looks like a empty filler, the 0001db7c address is the last byte which isn't FF recorded in this ROM. This is the version 2.07 of the Sony Video Titler software, built in 1989. There is a copyright notice from 1987, maybe from the first release? We still have more Video Titlers from Sony to examine. But, by now, Sony's the recycling queen! Panasonic did put their old font ROMs in the VW-KT300, but Sony reuses everything: all the Video Titlers uses a very similar build, the same HB-F1XD ROMs, same Kanji-ROMs and, except the Titler Software itself, all the other stuff are small updates from other ROMs released in other MSXs. Even the Titler Software, while not coming from their MSX computers, looks to be reused between it's Titlers (to check this we need to dump more ROMs to compare). They really know how to reuse their know-how and previous designs. If you want examine the ROMs, I put the dump files inside this tarball with a text describing their contents and what I know about them now. Good Luck!